Based on the same platform as the BMW 2 Series Active Tourer and X1, the 2017 MINI Countryman is the most anticipated new MINI since the F56 debuted four years ago. And today is the day the cover is lifted. 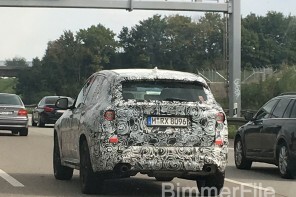 We’re going to have an enormous amount of content over at MotoringFile on the new car from images to videos to specs in the coming hours and days. But this first release is a full overview of the new car, it’s various models and the details MINI fans have been waiting for. So if you’re looking for a slightly smaller and slightly more British version of the X1, read on. MINI USA introduced today the biggest, most adventurous MINI ever, the all-new 2017 MINI Countryman. That’s not all. For the first time ever, a MINI model will be offered as a plug-in hybrid, combining the best of both worlds. The MINI Cooper S E Countryman ALL4 will be powered by both a three- cylinder MINI TwinPower Turbo Technology gasoline engine and an electric hybrid synchronous motor. All three of the new MINI Countryman variants will make their World Premiere at the Los Angeles International Auto Show at a press conference on Wednesday, November 16th, at 11:50 am PST. The all-new MINI Countryman has been completely redesigned and reengineered from the ground up, yet still is instantly identifiable as a MINI. Now incorporating BMW Group engine technology and vehicle architecture, the all-new MINI Countryman offers an all-turbocharged engine lineup with outstanding acceleration and the go-kart driving dynamics that MINI owners have come to know and love – especially when experienced with the added traction that comes from the latest generation of ALL4 all- wheel drive. At the same time, this new architecture delivers excellent ride quality and enables the most spacious MINI interior ever. The benefits from the BMW Group engine technology are evident across both the Cooper and Cooper S variants, with the new three-cylinder MINI TwinPower turbocharged engine on the MINI Cooper Countryman delivering 42 percent more torque than its predecessor, just shy of the outgoing Cooper S variant. 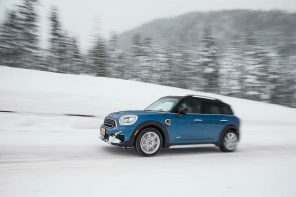 The MINI Cooper Countryman can also hit 0 – 60 mph 1.6 seconds more quickly than did its predecessor, and for the first time, can be matched with ALL4 all-wheel drive. Meanwhile, with 207 ft-lbs on tap, the turbocharged four-cylinder engine on the MINI Cooper S Countryman nearly matches the torque output of the outgoing MINI John Cooper Works Countryman. 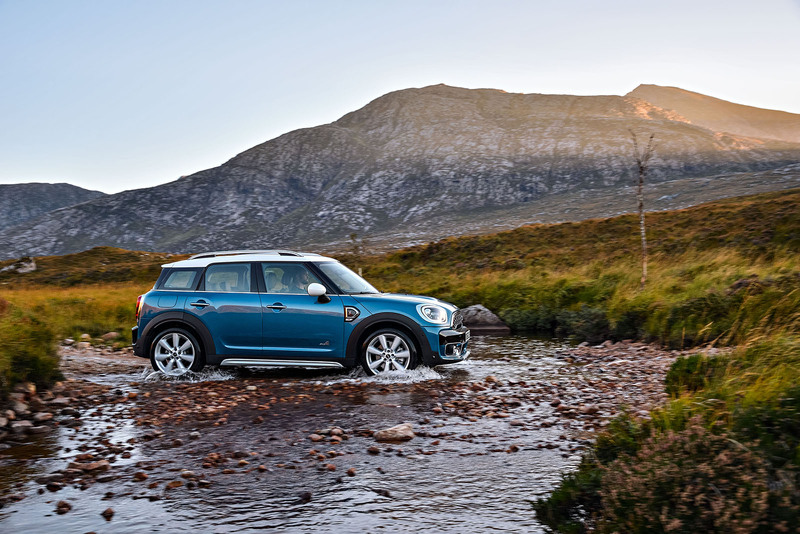 As the most adventurous MINI ever built, traction and performance in all kinds of conditions, wet or dry, rugged or smooth, straight or curvy, the new MINI Countryman benefits from the all-new ALL4 all-wheel drive system. The fully automatic system seamlessly delivers power to the wheels that grip and reacts to road conditions in as little as .25 seconds, with no action required by the driver or passenger. The biggest MINI ever means more space for cargo, people and anything else needed for your next big adventure. 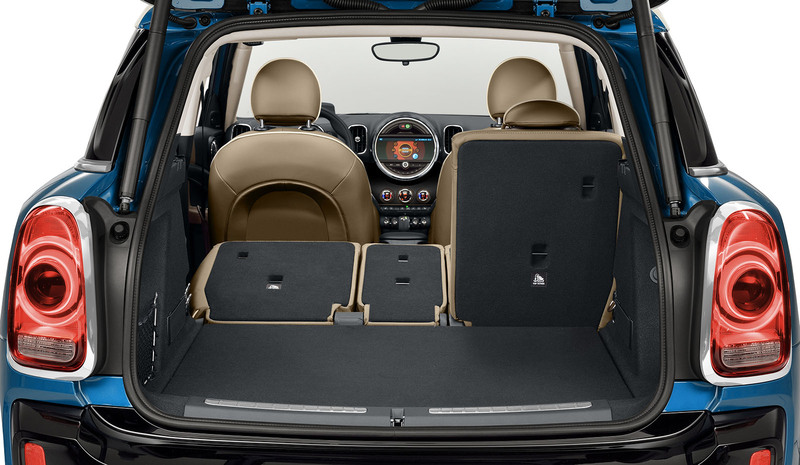 Not only does the all-new MINI Countryman offer cavernous cargo space – an increase of 30 percent compared to the outgoing generation – but with sliding, folding rear seats, a high roofline, and an adjustable trunk floor, it offers an incredibly flexible, versatile one too. The new MINI Countryman now has more front and rear legroom, front and rear headroom and rear seat shoulderroom than many of the major competitors in its class. Models with ALL4 all-wheel drive also come standard with heated seats. 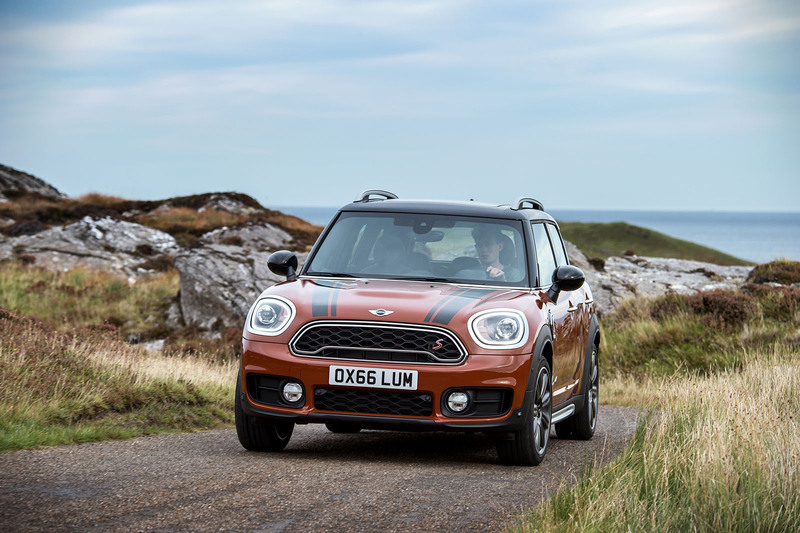 Cooper S models (with and without ALL4) come with standard LED headlights and daytime running lights, bolstered sport seats, and 18-inch light alloy wheels. In addition to the standard features highlighted above, the new MINI Countryman features a number of options to improve the overall experience for the driver and passenger using a completely new generation of technology. 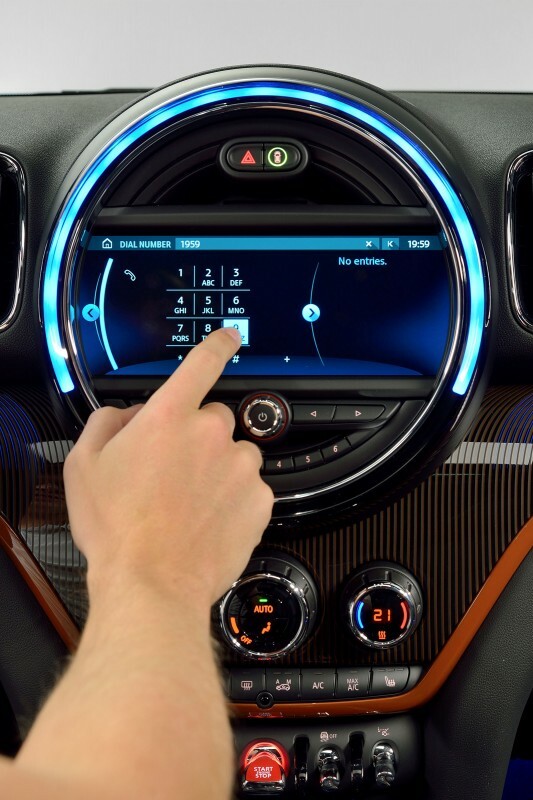 A Technology Package includes a new 8.8-inch touchscreen navigation system, driven by MINI Connected 5.0, a redesigned and new-generation user interface and operating system, as well as Qi wireless device charging capability and MINI Find Mate Bluetooth tags. The biggest, most adventurous MINI ever built will also be the most technologically advanced MINI when the brand launches its first ever plug-in hybrid model, the new MINI Cooper S E Countryman ALL4, in June 2017. 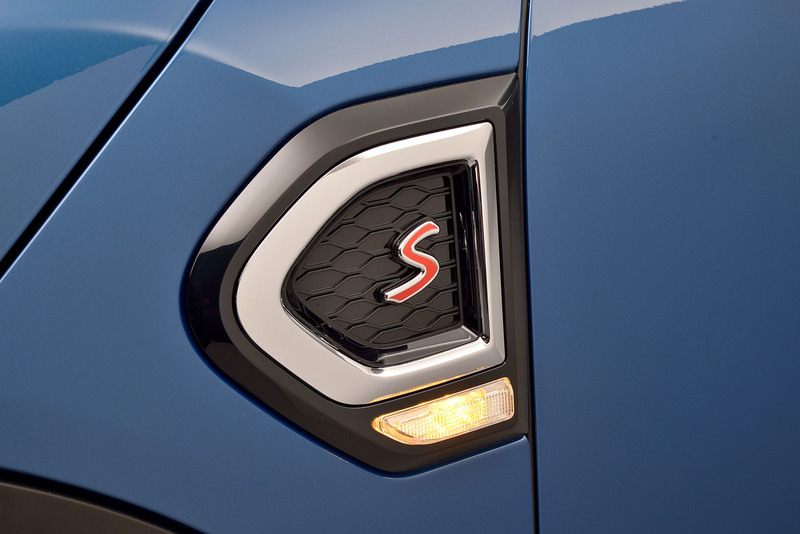 Behind the scenes, a 3-cylinder gasoline engine works in tandem with a powerful electric motor to produce a combined peak output of 221 hp, with the e-rear axle enabling all-season ALL4 traction – but for drivers, Cooper S E Countryman ALL4 simply means high-tech Motoring fun. It’s the perfect vehicle for city dwellers who wish to enjoy the benefits of purely electric mobility when commuting between home and work every day, for example, while at the same time benefiting from unlimited long-distance suitability on the weekend. Later this week, drone photographer Dirk Dallas (@dirka) will be taking the new MINI Countryman on a cross country adventure to its World Premiere in Los Angeles. Fellow MINI fans and adventurers can follow the action @MINIUSA as Dirk shares some of his favorite adventure spots across the country. Additionally, fans will have a chance at winning limited edition MINI Adventure Series patches by guessing Dirk’s #FromWhereIMINI location. 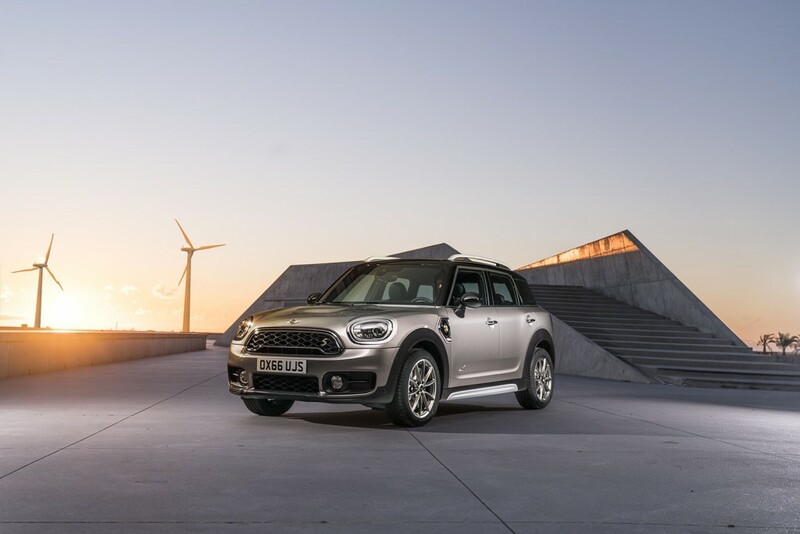 Click here for a full product press release and high resolution images of the new MINI Countryman and here for a full product release and images specifically of the new MINI Coooper S E Countryman ALL4 plug-in hybrid. The new MINI Countryman will go on sale in March 2017 at MINI dealers across the U.S. with the MINI Cooper S E Countryman ALL4 plug-in hybrid following in June 2017. Pricing for the U.S. market will be announced at a later date. The new MINI Countryman achieves its unique standing among direct competitors due to its powerfully expressive design, efficiently shaped bodywork and in particular its unmatched driving agility. The latest version of the ALL4 all-wheel drive system ensures driving fun beyond paved roads, too. 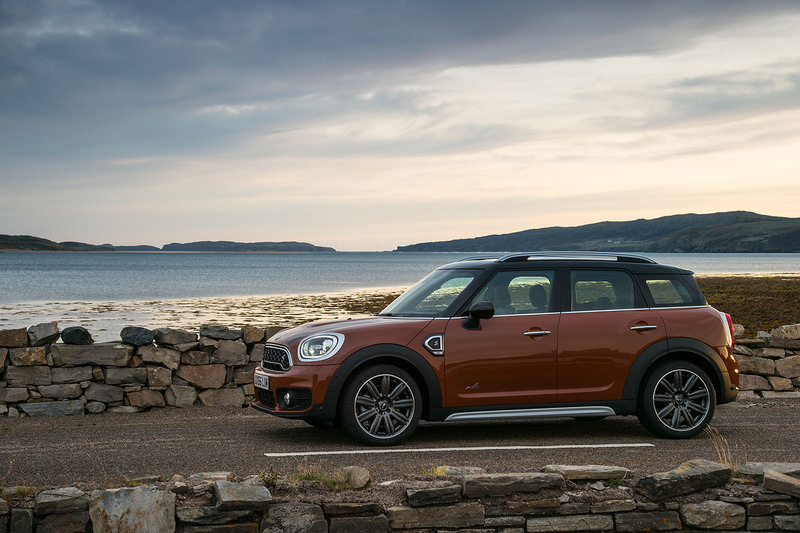 What is more, the new MINI Countryman is the first model of the brand to be available with a plug-in hybrid drive. In the form of the MINI Cooper S E Countryman ALL4 it has a range of up to 24 miles* running on electrical power alone. 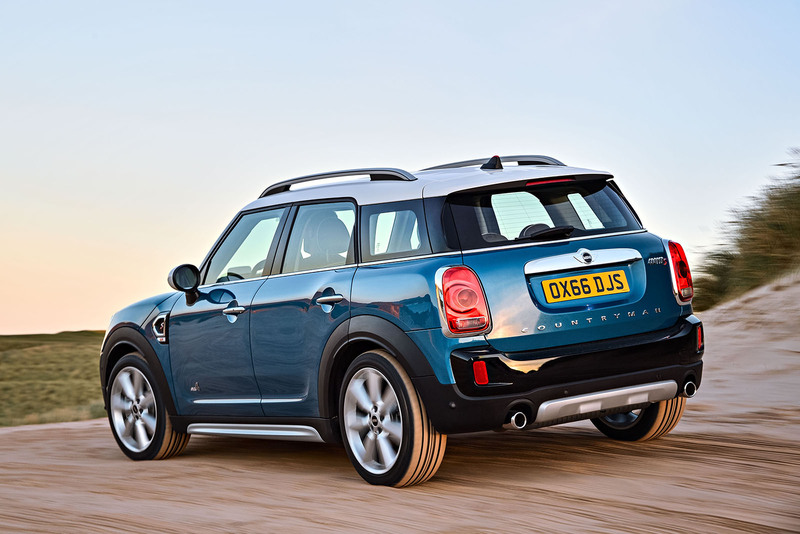 The new MINI Countryman – an overview of the innovations. Powerful proportions, 7.8 inches longer than its predecessor. Five fully-fledged seats, clear increase in space and versatility. New generation of engines and gearboxes, efficiency-optimized all-wheel drive system ALL4. MINI Connected App as a personal assistant on a day-to-day basis and when traveling. MINI Find Mate: everything you need on board at all times – or in view. More than seven inches longer than the predecessor model. The new MINI Countryman is some 7.8 inches longer than its predecessor and approximately one inch wider. Its wheelbase has been extended by 2.9 inches. This growth results in significantly increased space on five fully-fledged seats as well as a definite increase in storage volume and luggage transport versatility. The raised seating position ensures an excellent view and hallmark driving fun. The base of the rear seats can slide fore and aft longitudinally by up to 5 inches, . The rear backrest is comprised of three sections that can be reclined by passengers or folded flat independently of one another in a 40:20:40 split to accommodate many different combinatinos of passengers and cargo. The luggage compartment volume is 17.6 cubic feet and can be extended as required to a total of 47.6 cubic feet. This constitutes a maximum increase of 5.4 cubic feet as compared to the predecessor model. Five seats in the interior, two on the Picnic Bench. A power opening and closing tailgate is available as an option. The standard storage package comprises not only an adjustable-height cargo area floor, lashing eyes and tension straps but also a stainless steel insert on the loading sill. One unique option is the Picnic Bench – an upholstered, padded cushion that folds out of the luggage compartment and provides seating atop the rear bumper for two people while the vehicle is parked. World premiere in LA, market launch in February 2017. The new MINI Countryman sees its world premiere at the Los Angeles Auto Show on 15 November 2016. The market launch in Europe follows in February 2017. From March 2017 onwards the new MINI Countryman will also be taking roads and tracks by storm outside Europe. The U.S. market launch will take place in March 2017 for the Cooper, Cooper ALL4, Cooper S and Cooper S ALL4 variants and in June 2017 for the plug-in hybrid Cooper S E ALL4. 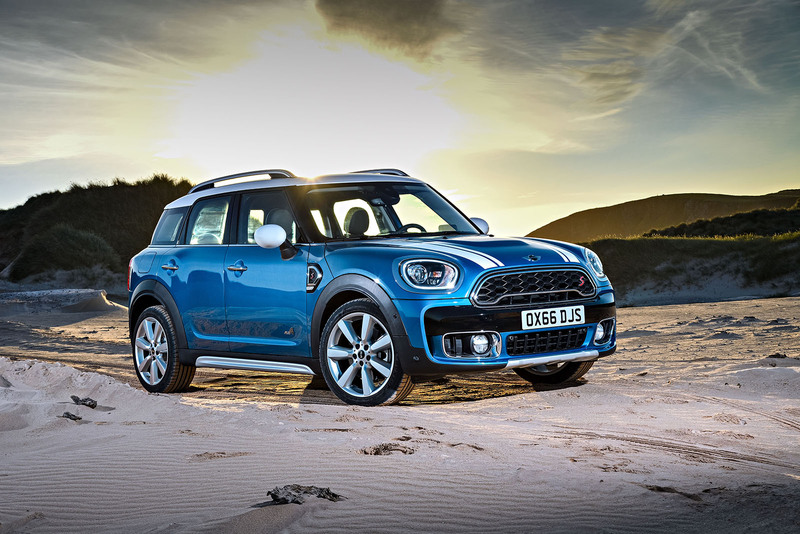 MINI Countryman: a successful model with traditional roots. Even with its model designation, the new edition of the MINI Countryman remains firmly rooted in the tradition of the British brand. A particularly versatile variant of the classic Mini once bore the same name back in the 1960s. Just like the identically constructed Morris Mini Traveller, the Austin Seven Countryman had a highly versatile interior, and the version with wood frame panelling – popularly known as “Woody” – attained cult status that it continues to enjoy to this day. The MINI Countryman likewise offered additional ways of enjoying the brand’s hallmark driving fun when it was launched in 2010. It was the first MINI with four doors, a large tailgate, five seats and optional all-wheel drive and a total of more than 540,000 were sold worldwide. 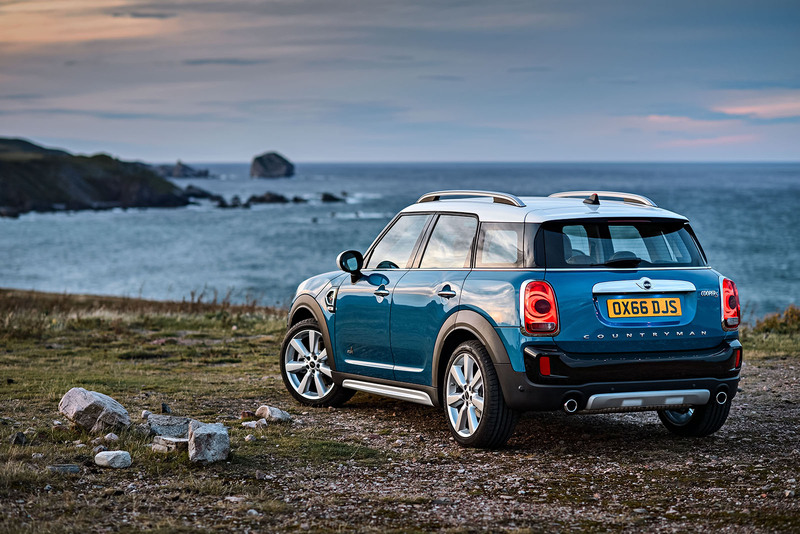 The latest generation of the MINI Countryman goes even further in terms of the model’s versatility, agility and premium character. Thanks to its powerful proportions, the new MINI Countryman has a particularly distinctive presence. Its unmistakable aura is defined by an extended ground clearance and raised seating position, further emphasised by the MINI ALL4 exterior look and high roof rails. 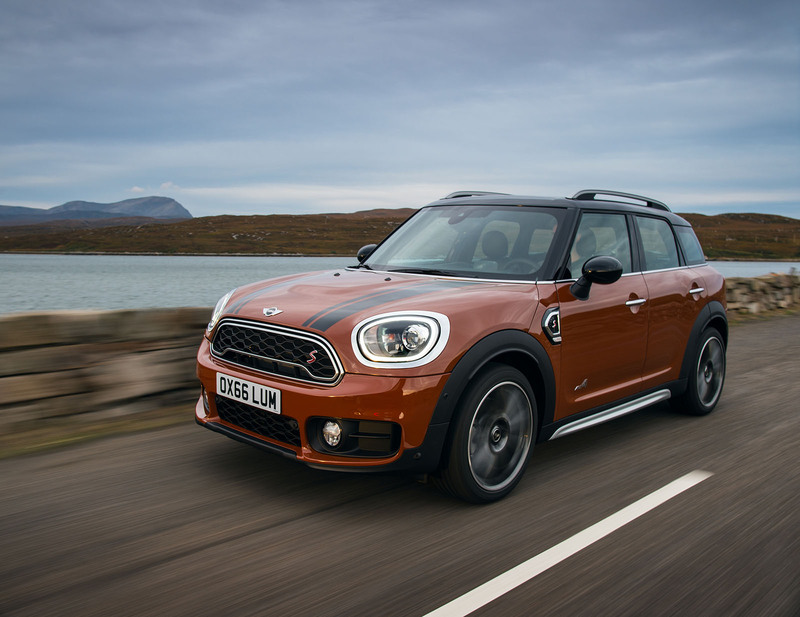 The new MINI Countryman features design elements that are typical of the brand, including the clear three-way structure of the side view – broken down into roof, glass section and main corpus – as well as the short overhangs, large wheel arches and downward increase in width. Precise contours on the generous surfaces create an attractive play of light and shade that underscores the car’s athletic shaping and the vertical orientation of the body. The selection of body finishes includes the two brand new colors: Island Blue and Chestnut. “The new MINI Countryman has essentially grown in size. 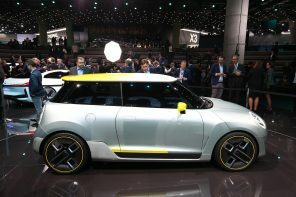 But it was still possible to retain the typical MINI proportions,” says Julius Schluppkotten, MINI Countryman project manager. Numerous model-specific design elements such as the striking helmet roof, the upright rear lights, the hexagonal radiator grille and the large headlamps have undergone evolutionary development. The side turn indicator surrounds known as side scuttles exhibit a new arrow-like shape. The roof rails in satin-finished aluminium are combined with silver-colored side sill tops, thereby lending greater visual emphasis to the car’s height. Horizontal lines dominate at the rear, with the vertically arranged light units providing an appealing contrast. LED headlamps with peripheral daytime driving light ring for the first time. The striking profile of the headlamp units deviates from the circular shape that is otherwise typical of the brand. Their distinctive, slightly asymmetrically rounded contour goes together with the radiator grille to produce an unmistakable front view. 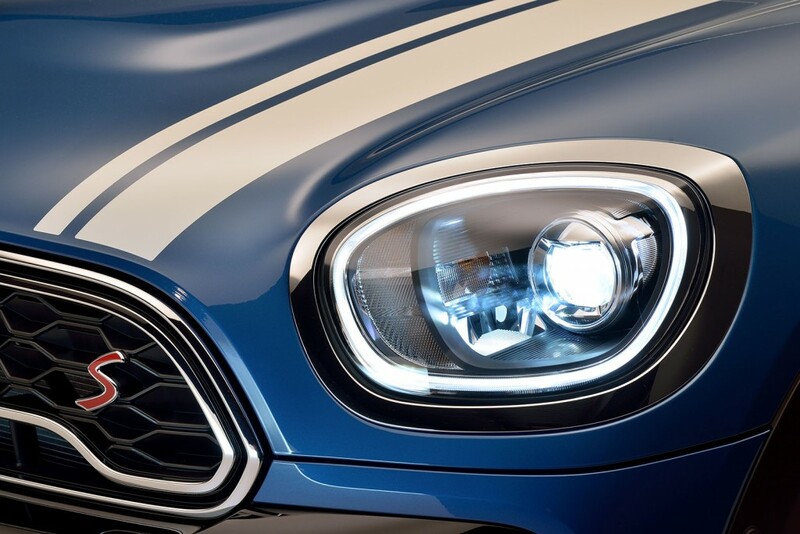 In conjunction with the standard LED headlamps (optional for Cooper and Cooper ALL4), daytime driving lights are generated for the first time by a band of light running entirely around each headlamp. More space for premium ambience. 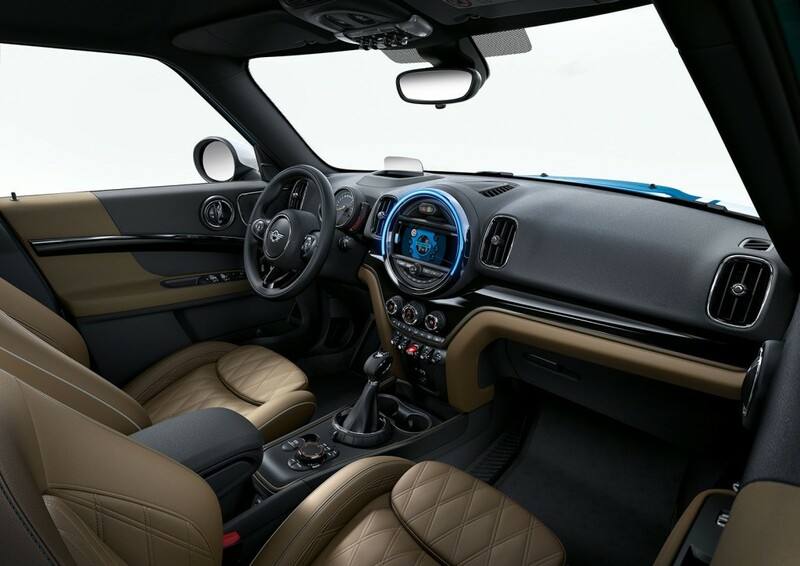 In the interior of the new MINI Countryman, a clear increase in space, refined premium ambience and a modern display and operating concept reflect the progress achieved through the change of generation. Both driver and front passenger benefit from extended head and shoulder space, while the adjustment range of the seats has also been enlarged. Power-adjustable driver and front passenger seats are available as an option, and include power-adjustable lumbar support and a memory function on the driver’s side. The narrow body columns and the high seating position make for optimum visibility when maneuvring. 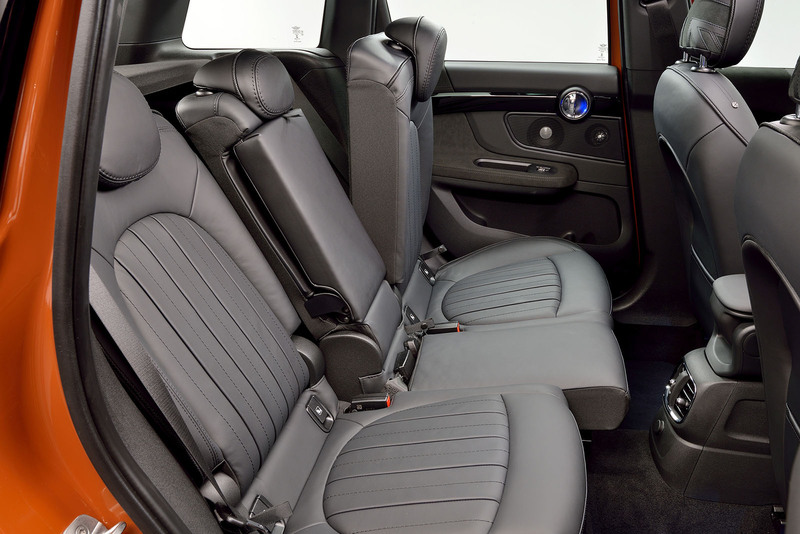 At the rear of the new MINI Countryman there are three fully-fledged seats. The rear door openings have been enlarged as compared to the predecessor model, now enabling a more convenient entrance and exit. In addition to interior width, leg space is now significantly more generous, too. The extensive storage facilities likewise contribute to the car’s optimized functionality. At both front and rear there are door pockets that hold one-liter beverage bottles. The fully-fledged center console extending up to the instrument panel has an integrated storage compartment and two cup holders in front of the transmission lever. The MINI Connected controller and the switch for the electrical parking brake are also positioned on the center console. “The interior of the new MINI Countryman emphasises the car’s suitability for families and as a primary vehicle. The sense of quality in the interior has been significantly enhanced, too” says Julius Schluppkotten, MINI Countryman project manager. With a clear horizontal structure, stretched lines and generously sized surfaces, the distinctively designed cockpit emphasises the solid character of the new MINI Countryman. The profile of the air vents echoes the vertical orientation of the exterior design elements. In addition to the high-quality materials and precise finish, the modern, ergonomically optimized controls contribute to the car’s exclusive ambience. The hallmark central instrument is integrated in the instrument panel and can, if equipped, incorporate an interactive and custom- configurable LED ring that provides illumination in response to driving situations by way of control feedback. This optional feature also comes with LED ambient lighting and a projection of the MINI logo from the exterior mirror on the driver’s side when opening and closing the car. Market launch with two engines. MINI Cooper Countryman: 3-cylinder engine, output: 134 hp, max. torque: 162 ft-lbs. MINI Cooper S Countryman: 4-cylinder engine, output: 189 hp, max. torque: 207 ft-lbs. Both engines, whether configured for front-wheel drive or ALL4 all-wheel drive, come standard with 6-speed manual transmissions. The Cooper S Countryman, Cooper S Countryman ALL4, and Cooper Countryman ALL4 are available with an optional 8-speed Steptronic automatic transmission, and the front-wheel-drive Cooper Countryman is offered with a 6-speed Steptronic automatic transmission. Soon after the launch of the new MINI Countryman, the range will expand to include the first ever MINI with plug-in hybrid drive: MINI Cooper S E Countryman ALL4: 3-cylinder gasoline engine, output: 134 hp, synchronous electric motor, output: 87 hp, system output: 221 hp. 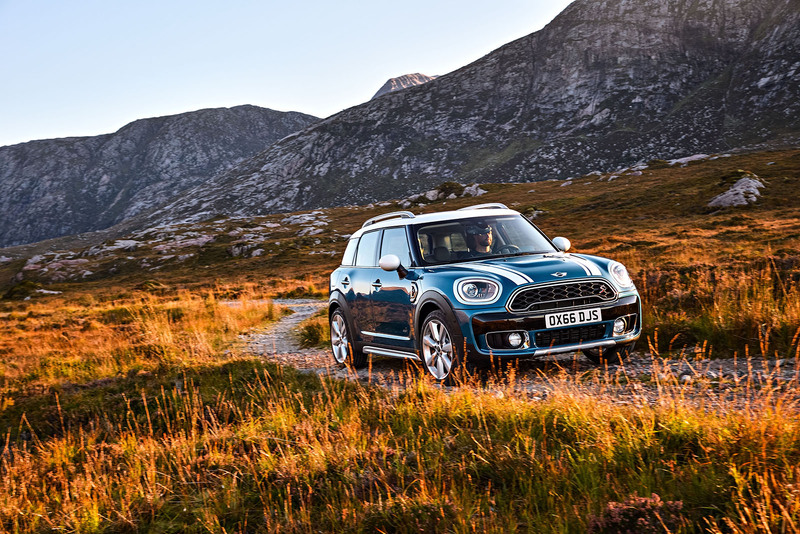 The latest generation of engines and transmissions gives the new MINI Countryman a perceptible increase in temperament as well as measurable improvements in terms of driving performance figures. For example, the new MINI Cooper S Countryman ALL4 with 8-speed Steptronic transmission sprints in 7.0 seconds from zero to 60 mph – making it 0.7 seconds faster than its predecessor model. The new all-wheel drive system ALL4: fast and precise, compact and efficient. 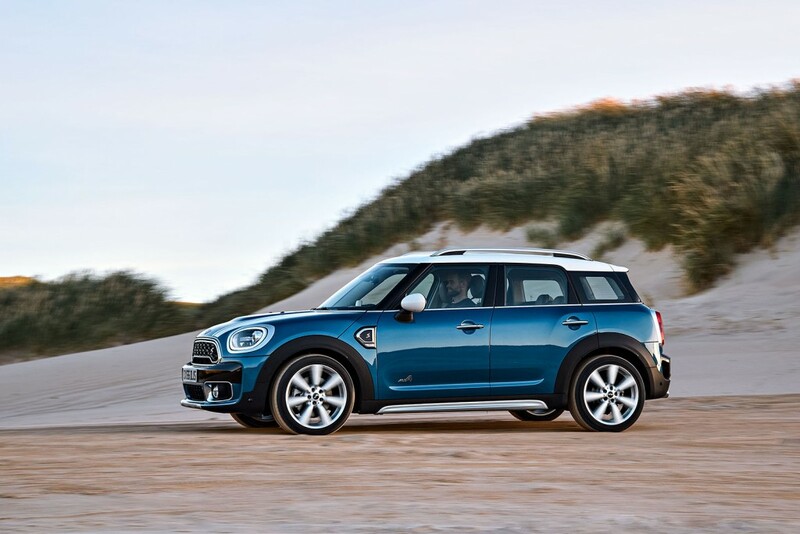 The new MINI Countryman also achieves outstanding efficiency figures in conjunction with the all-wheel drive system ALL4, which is optionally available for all engine variants. The new version of the all-wheel drive system not only reacts quickly and precisely to changing situations, it is also compact and offers a high level of internal efficiency. It consists of a power take-off unit integrated in the front axle differential, a propeller shaft leading to the rear axle and a hang-on clutch that ensures precisely measured transmission of the drive torque to the rear wheels. The system’s electronic control is interconnected with the Dynamic Stability Control DSC, so it detects any need to adapt power distribution early on. In this way, ALL4 optimizes both traction and stability in adverse weather and road surface conditions, as well as ensuring improved agility when taking bends in dynamic style. 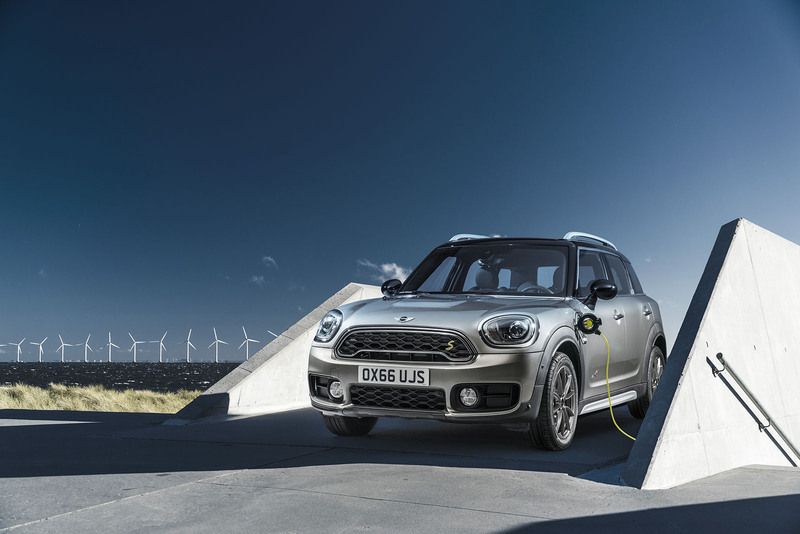 Electric and electrifying: the MINI Cooper S E Countryman ALL4. In addition to this, the new generation of the MINI Countryman also paves the way to driving fun that is locally emissions-free. The plug-in hybrid drive of the MINI Cooper S E Countryman ALL4 enables purely electric driving at a top speed of 75 mph. The spontaneously initiating, long-lasting and virtually noiseless power delivery of the electric motor provides an entirely new, ground-breaking perspective on the hallmark MINI go-kart feeling. No less fascinating is the precisely controlled interaction between the electric motor and the combustion engine of the MINI Cooper S E Countryman ALL4. The 87 hp electric motor directs its power via a single-speed transmission to the rear axle while a 3-cylinder gasoline engine with an output of 134 hp connected to a 6-speed Steptronic automatic transmission drives the front wheels. This combination produces an electrified all-wheel drive that ensures an optimum balance between driving fun and efficiency at all times. Driving fun made to measure: Dynamic Damper Control and MINI Driving Modes. 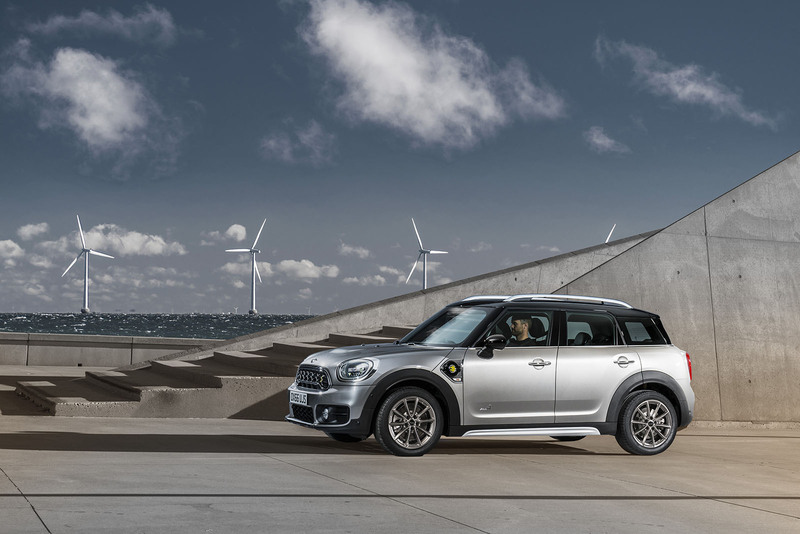 The high-quality suspension of the new MINI Countryman combines the tried-and- tested principle of a single-joint spring strut axle at the front and a multilink rear axle with a design that is optimized for weight and rigidity as well as a model- specific set up. This lays the foundation for precise handling properties and maximum agility. In addition to this there is an electromechanical steering with Servotronic function, powerful brakes and Dynamic Stability Control DSC. 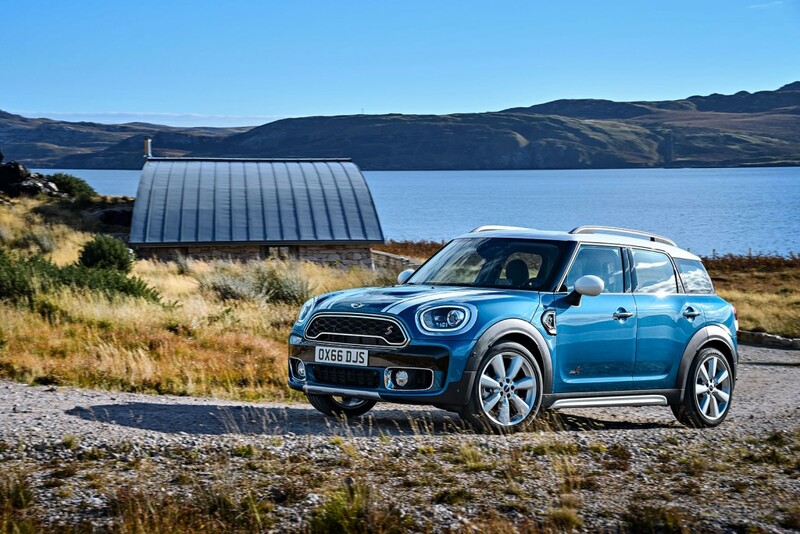 The new MINI Cooper Countryman and Cooper Countryman ALL4 come standard with 17- inch light alloy wheels, while the Cooper S and Cooper S ALL4 are fitted with 18- inch light alloy wheels as standard. The program of optional extras includes other light alloy wheel designs in sizes of up to 19 inches. Dynamic Damper Control is optionally available for the new MINI Countryman. Two program maps can be activated for the electronically controlled dampers via the likewise optional MINI Driving Modes. A rotary switch at the base of the gear or selector lever enables the driver to select a set-up according to one of the three modes MID, SPORT and GREEN. This also influences the accelerator pedal and steering curve, the operating mode of electrically powered comfort features and the engine sound and shift characteristics of the Steptronic transmission, depending on engine and fittings. Premiere: central instrument with touchscreen display. 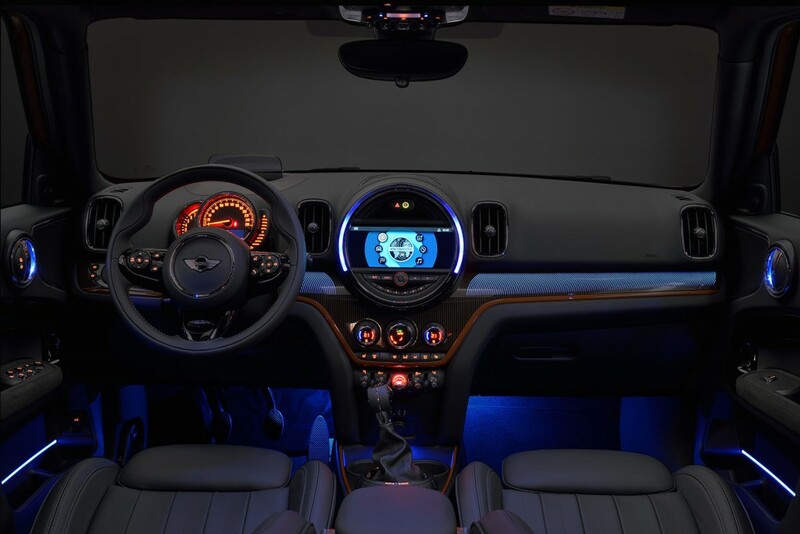 The standard fittings of the new MINI Countryman include Radio MINI Visual Boost with 6.5-inch color display and MINI Connected, Bluetooth support for telephone and audio streaming, and a rich 6-speaker audio system. Options include a powerful 12-speaker Harman/Kardon hi-fi audio system, and a new 8.8- inch touchscreen navigation system featuring a redesigned user interface and operating system. Modern driver assistance systems, high-quality options for increased comfort. 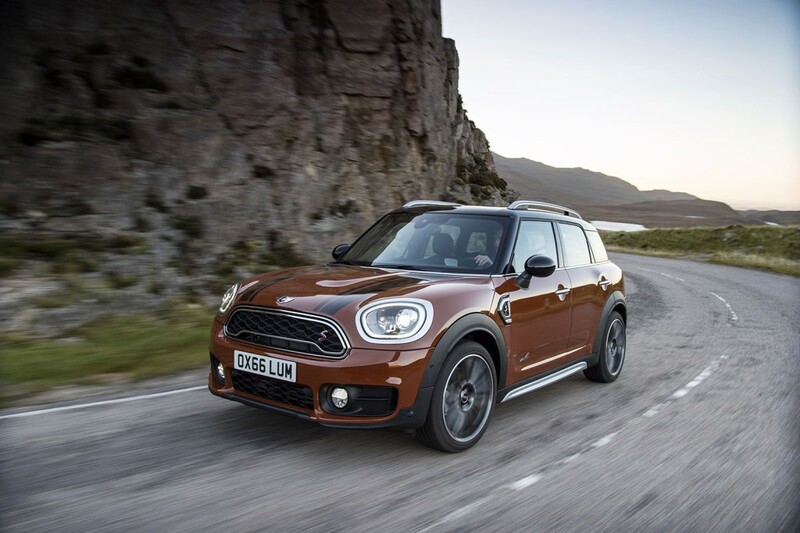 Driving fun in the new MINI Countryman is based not just on versatility but also on safety and comfort. The standard rear view camera and rear Park Distance Control can be extended to include front parking sensors and the Parking Assistant feature for easy parallel parking. Optional MINI Driving Assistant includes collision warning with city braking function, camera-based adaptive cruise control, pedestrian warning with initial brake function, high beam assistant and road sign detection. The program of standard equipment items further includes a deal-zone automatic climate control system, a panorama glass sun roof, automatic headlights, rain- sensing windshield wipers, and Comfort Access keyless entry. The broad range of exterior paint finishes, seat upholstery types and interior surfaces enables individualisation of the new MINI Countryman in a way that reflects personal style. With the MINI Yours Interior Styles option available in three variants, the striking interior surface design in the cockpit is highlighted by means of backlit decorative strips. Connectivity also moves into a new dimension with the launch of the new MINI Countryman. MINI Connected now goes beyond the familiar in-car infotainment functions to become a personal mobility assistant as part of a holistic concept that provides support for individual mobility planning outside the vehicle, too. Based on a flexible platform, the Open Mobility Cloud, MINI Connected integrates the vehicle seamlessly into the MINI driver’s digital life via touchpoints such as the Apple iPhone and Apple Watch. At the heart of this connectivity in the new MINI Countryman lies MINI Connected, the personal mobility assistant available to MINI drivers with new innovative services as of November 2016. Here, individual mobility planning enables punctual, stress-free arrival at appointments. And mobility doesn’t start in the car: MINI Connected informs the driver of the optimum departure time based on calendar entries and current traffic data. Address data and appointments saved by the driver previously on a smartphone via MINI Connected are automatically transferred to the car and do not have to be entered in the navigation system again. MINI Connected can also save regularly visited places as favorite destinations and it detects frequently covered routes such as the daily run between home and work so as to be able to inform the driver in the event of unexpected traffic delays. Another new feature in the area of connectivity is MINI Find Mate. Included with the 8.8-inch touchscreen navigation system, Find Mate consists of two tags with a Bluetooth wireless tracking function that can be attached to frequently used objects and travel items such as bags, cases, key rings and rucksacks. MINI Find Mate is able to detect the presence or absence of any such objects connected to the system that the driver wants to be sure not to forget: tracking is done not only on the on-board computer of the MINI Countryman but also on a smartphone. Providing there is a Bluetooth connection with the tag, an acoustic signal can be activated in the car or on the smartphone to help locate the object. If the tag is outside the Bluetooth range, the driver can be guided to the place at which a connection was last detected.